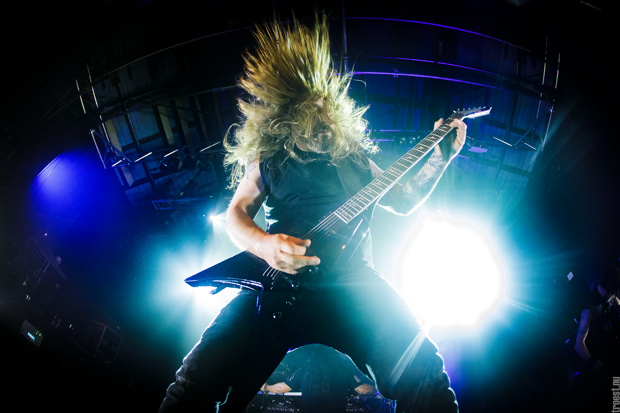 In my younger years, it was melodeath paved the way for my exploration of the more extreme corners of the metal genre, and among my most treasured artists back then around the turn of the millennium was Hypocrisy. As such, it baffles me that it has taken me 14 years since I first heard “The Arrival” to cross the band off my bucket list. 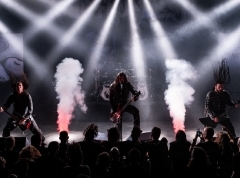 To be fair though, Hypocrisy’s last concert in Denmark took place in Århus in 2006, so opportunities for doing so without traveling abroad have been hard to come by — this despite the fact that the Swedish quartet did, in fact, release three full-length albums over the next seven years. 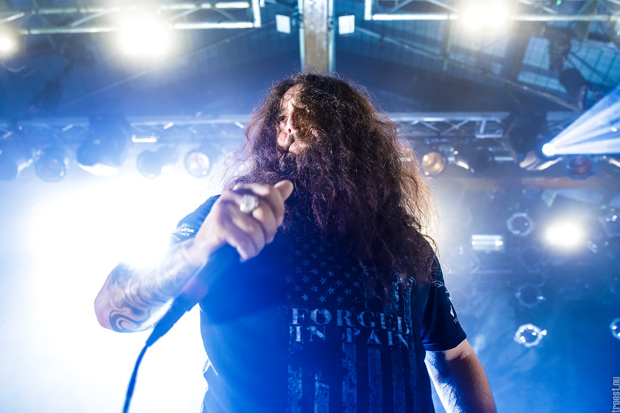 A period of relative quiet since then has not discouraged a sizeable audience from turning up here, however, to watch the band co-headlining alongside another one of death metal’s ’91 alumni: Kataklysm. Charged with warming up the crowd are the German newcomers of The Spirit, who, judging by the likes of “Cosmic Fear” (off last year’s “Sounds from the Vortex” début), have their fingers deep in Dissection’s cookie jar. 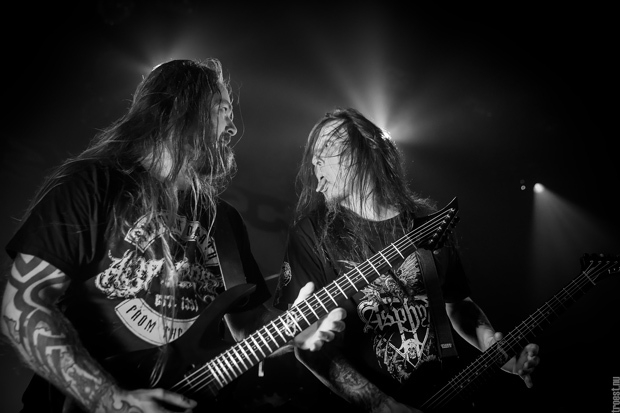 Pitch-black death metal with windswept tremolo melodies and eerie, ringing chords galore is the band’s weapon of choice, and it finds a willing recipient in many an attendee during the first couple of tracks. But as the clock ticks away, the Saarbrücken-born quartet’s single-mindedness when it comes to songwriting, starts dampening the impact the music has on me, the next barrage of wintry grandeur sounding alarmingly much like the last. The incessantly flickering strobe lights amidst the dim blue and turquoise hues do little to help, forcing people to look away for entire songs instead of taking in the typically grim appearance and windmilling antics of the four musicians on stage. Their performance, like the formula underlying the music, is conservative to the bone, which I suppose explains their signing with Nuclear Blast earlier this year. Still, while the band’s expression is a bit too monotonous to warrant dubbing them a rising star just yet, the likes of the closing track, “The Great Mortality”, nonetheless pack enough promise — the spectacularly ominous melodies in particular — to make the eventual sophomore album worth looking forward to. As melodic death metal became a sort of peripheral interest of mine, so, too, did this legendary band... which would explain why the likes of “Valley of the Damned” and “End of Disclosure”, both of which stem from the later portion of Hypocrisy’s discography, are completely unfamiliar to me when they are aired early on. The four musicians, led by the iconic Peter Tägtgren (guitar & vocals) and his longtime collaborator Mikael Hedlund (bass guitar), seem thrilled to be here though, performing with grit and fondly reminiscing about their last concert at this venue back in 1993. Indeed, where The Spirit came across as bleak, Hypocrisy and Tägtgren in particular have a jubilant air about them, with the frontman taking every opportunity to instigate a reaction from the audience, and gesticulating much more than you would expect from a vocalist who also wields a guitar. But this jubilance is never at the expense of intensity, which is discharged in plentiful amounts during the likes of my personal favourite, “Eraser” off 2004’s “The Arrival”, and especially the early ‘90s medley blending “Pleasure of Molestation”, “Osculum Obscenum” and “Penetralia” into a speedy and hard-hitting concoction of deep growls and thrashy riffage. This burst of brutal, old-school death metal goes down well with the audience and adds much-needed variety to a set that, at times, does grow a little uniform in its style to be honest. With the changeover fast approaching, Hypocrisy spend most of their allotted time on what’s essential — namely unloading as many outtakes from their extensive repertoire as possible in a rapid-fire style. While this means that fans are given their hearts’ desire of material from 1992’s “Penetralia” all the way to 2013’s “End of Disclosure”, it also means that one never feels part of a narrative like at other career-spanning performances. As Tägtgren and his colleagues charge through their 12-song setlist, I thus resign to feasting on the overload of malicious harmonised melodies and wicked grooves that songs like “Fire in the Sky” (off 2000’s “Into the Abyss”) and “Killing Art” (taken from 1996’s “Abducted”) have to offer, whilst also lamenting the fact that my first encounter with a band that is both legendary and important to my childhood feels so… impersonal. 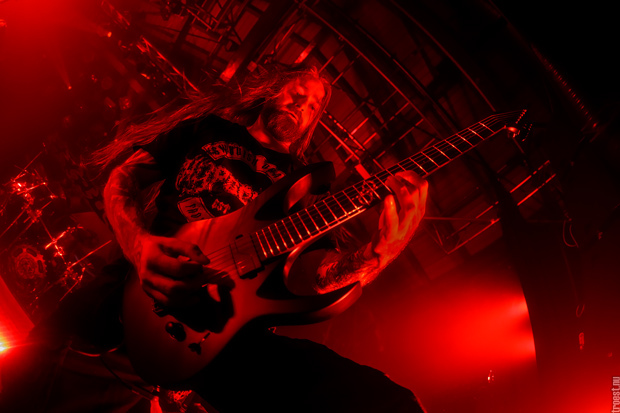 I have nothing but praise for a commanding performance such as this, and for Hypocrisy’s capturing their own evolution so perfectly through lighting (which reflects the artwork of the album in question) and sound (when juxtaposed, the pre- and post-millennial songs for instance reveal a stark contrast between Tägtgren’s vocal style, and the tone of his guitar melodies). I just wish the band had been given the ‘true’ headlining slow instead of Kataklysm. For the sake of transparency, I have to admit that Kataklysm and I never clicked. To this day, the Canadian death metallers’ longevity and popularity remains a mystery to me; surely, given the simplicity of their songs and their resistance to any kind of innovation other than introducing a little bit more melody to their music in this decade, most people would have abandoned ship by now? But no — while the crowd does seem to thin out with each passing chug, breakdown and inspirational quote by vocalist Maurizio Iacono, the band looks to have a loyal following still, of people less interested in elegance than in some good ol’ fashioned, violent fun. Admittedly, the likes of “Fire” (taken from 2013’s “Waiting for the End to Come”) and “As I Slither” (off 2004’s “Serenity in Fire”) provide the perfect soundtrack for the headbang- and mosh-hungry among us with their groove-based formula, even getting a skeptic like myself carried away at times. And Iacono must also be praised for his handle on the frontmost audience, many of whom look like they’d gladly drink poison to serve their towering master. But while I’m not going to criticise anyone for taking the music of Kataklysm at face value, I myself cannot find enough meaning in it to muster up a real interest in scouring through 27 years’ worth of their material tonight. Indeed, the steady hand and subtle elegance of Hypocrisy now stands in vivid contrast with the brute-force-approach employed here, with every quiet(er) moment witnessing some sort of war cry from Iacono, who promises to send those unwilling to participate in the mayhem to the back of the venue and ”turn this boring Monday into a party”, fuelled — of course — by the alcohol he encourages everyone to keep drinking. By the time “At the Edge of the World” (taken from the band’s 2010 album, “Heaven’s Venom”) concludes the festivities, only about a half of the original audience still remains — the rest have seen beyond the smoke and mirrors and found one of the lowest denominators of the death metal genre, with little else to offer than extremity and defiance. Still not my cup of tea, but to each their own.